Have you noticed that many celebs are packing on the…accessories. Tons of bracelets, doubling up on necklaces, and sometimes even wearing multiple watches. So how do you know when enough is enough and when to add a little more?While you have to personally decide what you feel comfortable wearing, there are also a few key rules to stick to. Here are some examples of the good, the bad, and the bling. 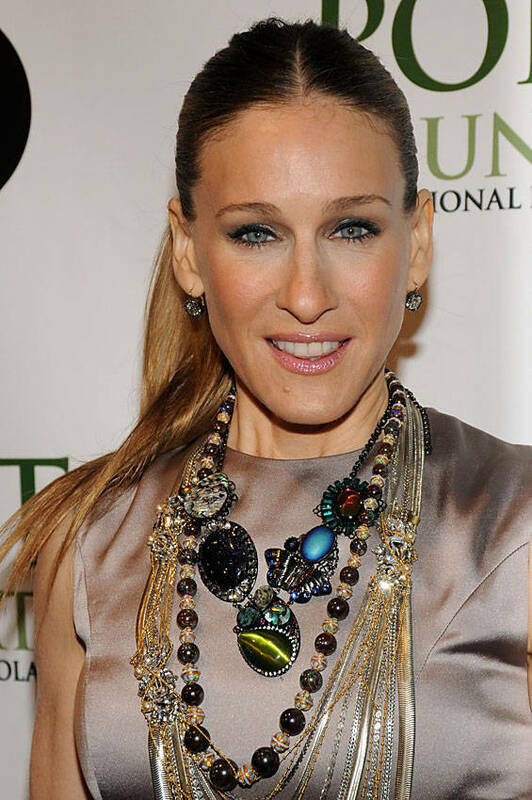 Sarah Jessica Parker has found a way to wear multiple necklaces and make it look good! The key to her fabulous look is that she has decided to tone down the rest of her outfit. Her dress is simple, her hair is pulled back, and she went with small hoop earrings so as to not distract from her layers of necklaces. The simplicity of the rest of her outfit really lets her over accessorizing stand out. And here is an example of too much accessorizing. Paula Abul has made the mistake of too much in one area. While her necklace and earrings would be great statement pieces on their own, it is overwhelming to put them together. To improve this look she should either wear smaller earrings with the large necklace, or pair the earrings with a lighter necklace. This is a great example of how to over accessorize your wrists. Since everything is on one wrist, it’s best to leave the other wrist bare or just add one light bracelet. By concentrating on just one arm it doesn’t over power you. You could even have a ring or two on either hands and it would still look good. This is an example of the bad bling. This is way too much overall. I don’t know how someone wearing all this wouldn’t fall over from the weight. If you want to wear bracelets on both hands it should be a few light bracelets and maybe a watch or a thicker bracelet on the other arm. Also, pick a few rings, every finger does not need jewelry. 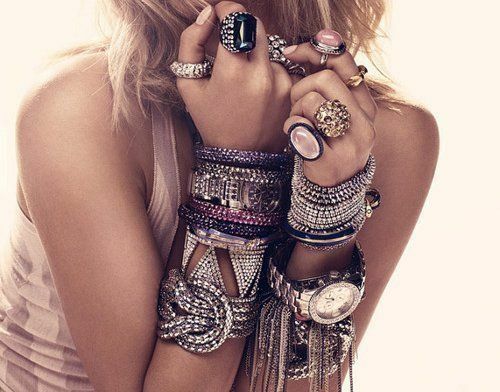 While over accessorizing is a great jewelry trend that is fun to play around with, make sure that you do it right. You don’t want to overdo one part of your body. If you’re wearing a large statement necklace, stick to small earrings. If you want to play up a bundle of bracelets, don’t cover both arms up to your elbows. 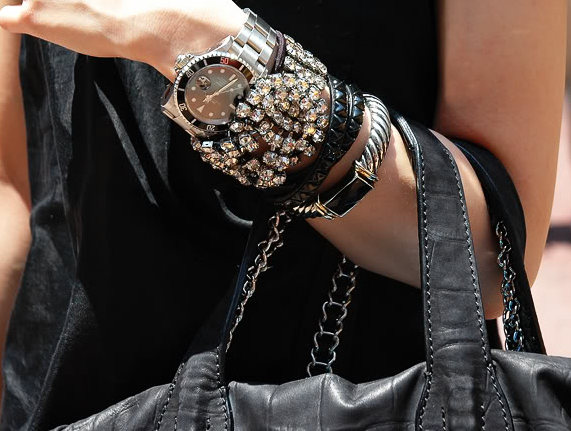 Follow these few simple rules to help you successfully over accessorize.